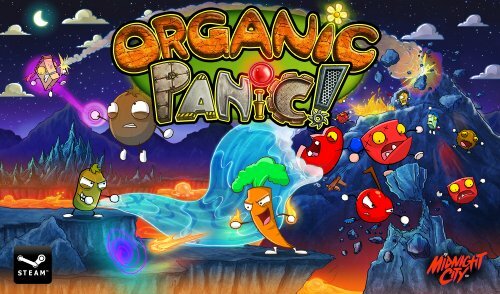 Organic Panic - PlayStation 4 Review — GamingWithSwag.com - Dads By Day, Gamers By Night. High Level Premise – Solve a variety of physics-based puzzles using various organic-themed characters, each with their own set of special powers and abilities. Music/Soundtrack – Upbeat and lively jams that complement the quirky themes and style. Story – Use your collective Organic powers to overcome the evil Meats & Cheese Empire! Replay-ability – Moderate, levels can be replayed to improve overall score, which can help with unlocking trophies/achievements. Value – Moderately High; A generous number of single & multiplayer stages to master. Favorite Element – Pint-sized stages for those short gaming sessions. Beautifully detailed environments come to life in Organic Panic. Sean says: As a family friendly puzzle platformer, Organic Panic gets a lot right. Its use of multiple, unique characters, variable and physics-based environments, and an abundance of short-and-sweet stages bring a wealth of entertainment and value to this family friendly package. Organic Panic was not thrown together in a weekend. The game provides the player(s) with a cast of four distinctive characters, each with their own remarkably different handling & physics - it’s rare to find this kind of variety in video games these days. These characters are unique to their own specific stages, both within the single-player campaign and optional multiplayer stages. Environments are destructible, and allow for more than just one way to complete a stage in many cases. Organic Panic is enjoyed most when playing with other people. Thematically, it’s inviting to everyone. Even the single player campaign, which makes up the bulk of the content, can be enjoyed by the whole family in determining different approaches to solving any number of puzzles. While the game does offer local competitive multiplayer, this doesn’t come off as important as the teamwork-driven co-op stages. Games like Organic Panic are important, as they provide quick, wholesome co-operative family entertainment experiences in a market flooded with just the opposite. While the titles target audience may not be as common as it once was, those who are lucky enough to stumble across this gem are in for a real treat. Campaign progression adds new variables to keep things fresh and interesting. Gareth says: Team Fruits and Veggies vs Meat and Cheese! Organic Panic is a mix of both puzzle and platform. One of them I liked, the other not so much. The puzzle portion is great. This mixed with the fact that in theory the whole world is destructible makes it more fun. I can fill this hole with water to kill the meat. I can get a speed boost and chew my way right up the middle of this part of the level. These aspects of the game were well received – it reminded me a bit of Super Meat Boy. What I did not like was the “fighting” with the meats and cheese. There were some parts where it was part of the puzzle, which was fun. There were other parts where I felt it killed the pacing of the game by forcing me to deal with all of the enemies, especially if I wanted my gold star at the end. It’s not a bad game by any means. If you have nothing to play, give it a try. The PlayStation Store is filled with fun little games like this for those quick “pick up and play” gaming sessions that don’t take themselves too serious.